The eastern sky these fine late October nights is filled with deep sky treats for stargazers of all types. There is a bit of something for everyone. The October night sky map here provides a reference showing where to look to see this month's night sky treats. Galactic star clusters are groupings of stars which share a common origin relatively recently on the astronomical time scale. Their stars are often similar in color and brightness, and share a common motion through the galaxy. The Pleiades is a compact cluster of young bright stars located 410 light-years from the sun. It was known as the Seven Sisters in antiquity, although really only six stars are easily counted with the naked eye. How many can you see? Its Japanese name is Subaru, and its six brightest stars are well depicted in the logo of this Japanese car manufacturer. The Hyades is much closer to us than the Pleiades, 150 light-years away, but its stars are older and fainter than those of the Pleiades, so it covers a much larger area of the sky. It is easily spotted as it appears to surround the bright red giant Aldebaran. But, this is merely an accident of perspective, as Aldebaran is only 65 light-years away, much closer to us than the Hyades. 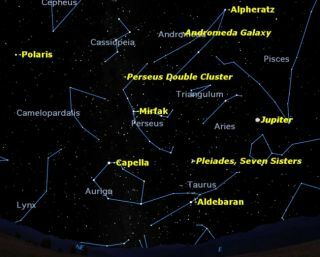 Although all three of these clusters are easily visible from a dark sky site with the naked eye, they all benefit from a closer look with binoculars. Look in particular for the many pretty pairs of stars they contain. Under very dark skies, the Pleiades show faint wisps of nebulosity from a dust cloud through which their stars are passing at present. Binoculars reveal several other deep sky treats in this part of the sky. Circling the "north star" Polaris directly opposite the Big Dipper is the bright W-shaped constellation Cassiopeia. The upper part of the "W" points the way to the Andromeda Galaxy, number 31 in 18th century astronomer Charles Messier's catalog of deep sky objects. In binoculars, the Andromeda Galaxy looks like a small faint cloud. We are seeing only the bright central nucleus; long-exposure photographs reveal that the galaxy is far larger than our moon in the sky. If you have a telescope and a dark country sky, look for Andromeda’s two satellite galaxies. These are farther away than you might expect from photographs; those same long exposure photographs mislead by making the main galaxy seem much larger than it appears in small telescopes. Once you’ve located the Andromeda Galaxy in binoculars, see if you can see it with your naked eyes. In a dark moonless sky it is about the farthest object visible to the naked eye, looking like a tiny wisp detached from the Milky Way. If you spot it, you can say that you’ve observed something over two million light years away with nothing but your unaided eye. About halfway between Cassiopeia and Mirfak look for the Perseus Double Cluster. This gives you two galactic clusters for the price of one. These clusters are much farther away than the first three we looked at. They are about 7,000 and 8,100 light-years away. Early astronomers mistook these clusters for stars, and assigned them the letters "chi" (Greek) and "h" (Roman). They are also known by their numbers in the New General Catalog: 869 and 884. It’s a mystery why Messier didn’t include them in his catalog, since they are far brighter than many objects he cataloged. Finally, take a look with binoculars or a telescope at the area around Capella. The constellation Auriga forms a beautiful circlet of bright stars, enclosing one of the richest areas of the Milky Way. There are many bright star clusters in this area, including three in Messie's catalog.